We are Hideki Nakazawa and Mika Kusakari, artists and the founders of AI Art and Aesthetics Research Group (AIAARG). Our "Artificial Intelligence Art and Aesthetics Exhibition," the world's first exhibition that comprehensively features art and artificial intelligence across diverse formats, is now going on at the Okinawa Institute of Science and Technology Graduate University (OIST) with great popularity through the 8th of January. "AI Aesthetics and the Polytheism"
* Open Discussion will follow the lectures. * Recorded videos will be released. "Disembodied cognition as a new concept of intelligence from a viwepoint of 'Projection Science'"
Hiroyuki Okada (Head, Advanced Intelligence and Robotics Research Center (AIBot) Research Institute, Tamagawa University. Executive Director, The RoboCup Japanese National Committee) "Projection Science" is a completely new methodology for elucidating human cognition, and it is argued that the process of projecting the representation into the outside world is the source of the subjective experience from the stimulation and information of the physical world. In my talk, we discuss the possibility of a new cognitive mechanism of disembodiment cognition by rethinking the concept of physical cognition so far from the viewpoint of Projection Science. In particular, we want to consider phenomena that are believed to exist for some reason "Projection Science", even though there is no external object directly related to generation of symbols such as ghosts or gods, or not recognized. "Influence happen to R&D of AI through Western or Oriental perspective"
Current AI R&D based on machine learning technology should be seen as intelligent information processing technology. And, as second step, R&D of "general" and "autonomous" AI, which is true AI, is going to begin acceleration. AI system becomes large and complicated, and it will be difficult to understand the whole system 100%. Conventional science and technology has been mainly designed in a top-down manner, but for large-scale complex systems it is necessary to adopt a bottom-up method as well. The top-down method has high affinity with the Western perspective, while the bottom-up method has high affinity with the Oriental perspective. In this presentation, let's think about the influence happen to R&D of AI through Western or Oriental perspective. * (III) "Traffic Signal Control by DQN" "Multi Layered Emergent Architecture" (2) Auditorium. "What will adaptive autonomous robots dream of?" Until just a few years ago, robots and AI agents were to apply rules designed by humans to given inputs. By a happy marriage with deep learning, reinforcement learning can now be applied to real-world problems so that robots and AI agents can acquire their own action policies. Reinforcement learning is a framework for maximizing externally defined “rewards,” which could be running as fast as possible or gaining as much game scores as possible. Can robots and AI agents find and select their rewards by themselves? If they can, what would those rewards be? I will introduce our research trying to answer those questions. * (IV) Kenji Doya and the Smartphone Robot Development Team "Can Robots Find Their Own Goals?" (20) Level B, Center Bldg. "Artificial Consciousness / Artificial Life"
"Artificial Consciousness and the Android 'Alter'"
When do we feel that we have a mind, or how could we install the mind on the machine? We take two approaches, the experimental and the constructivist, to answer these questions. In the experimental approach, we will draw on a cognitive experiment, called the perceptual crossing experiment, in which the subjects perceive the existence of their partner from tactile interaction in a virtual space. In the constructivist approach, we create an Android named "Alter" and let it interact with people to foster humanity in Alter. The first approach shows that passive touch is essential to perceiving others (Kojima, H. et al. Front. Psych. 2017). The second method demonstrates the advantages of the principle of stimulus avoidance found in model neural network (Doi, I. et al., ECAL 2017). From these experiments, I will discuss the innovative and complex dynamics aspects of man-AI/ALIFE interaction (Takashi Ikegami and Hiroshi Ishiguro, In Between Man and Machine: Where is Mind?, (Kodansha, 2016)). "Conscious AI, General AI, and Living AI"
We have two naive intuitions about consciousness. First, life forms have conscious experience. We tend to acknowledge inner conscious experiences in biological organisms, but not in machines. Second, highly advanced AI has consciousness. In Sci-Fi films, advanced AIs gain experiences of emotion and intention. While it is possible to analytically discern the differences among consciousness, intelligence and life, I will illustrate the close relationships among the three from the perspective of generative models of the self, and the philosophical stance called biological naturalism. In the same vein, I will argue that general AI as we conceive could possess phenomenal consciousness, and propose a method to test phenomenal consciousness in machines using theories such as integrated information theory. "Imagining the interface between behavior and intelligence in slime mold of single celled organism"
Slime mold Physarum, an amoeboid organism, moves around on the dark and humid floor of woods, and can trying to avoid predators and exposure to sunlight while coming closer to foods. It may often meet a difficult decision to choose whether to go or not to go. Life is not always easy even in slime mold although the life style of it is totally different from human. It is not easy for us to imagine how properly his behaviors work in wild environments. After all, I like to throw away the stupid opinion that single celled organism is stupid. 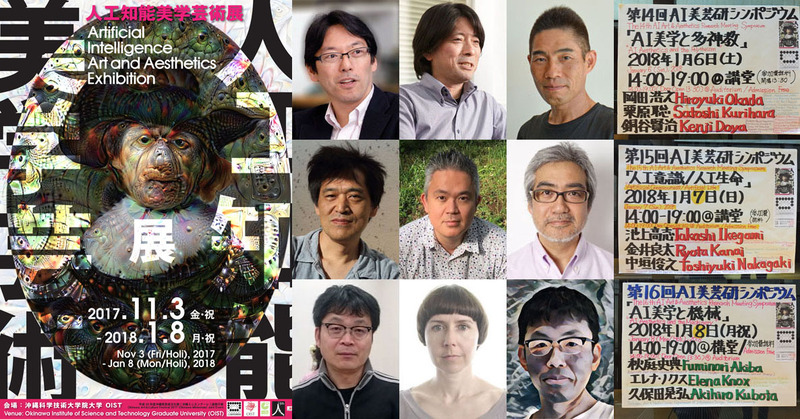 "AI Aesthetics and the Machinery"
* Unfortunately, Inke Arns cannot attend. "The Role of Aesthetics and the Question of Art"
There are two things I want to talk about. They are about the title of this exhibition: Artificial intelligence Art and Aesthetics. First, what is the purpose of aesthetics, who is the subject of it? After confirming them, I would like to think about what we need to prepare to think of the aesthetics for artificial intelligence. Another topic is art. However, I do not argue what art is. Instead, I would like to rethink about why artificial objects that artificial intelligence might create in the future need to be considered from the perspective of art. Elena's talk will unpack and evaluate her very recent art experiment (December 2017) Omikuji, part of a new series of AI - art experiments Alter versus Deep Belief. Alter the robot (Ikegami Lab/Ishiguro Lab) was live-streamed by Watanabe Lab between Tokyo and Seoul. Alter has experimental AI. It uses a self-organising neural network to make sense of its world. Such AI strategies include deep belief networks, through which machines determine certain inputs to be believable. In our world today, understanding belief systems is important to the inter-harmony and the preservation of culture. Omikuji is a participatory artwork exploring the way machines, and humans, learn to believe things - and how, via robotics both hard and soft, they may embody those beliefs. We want to uncover and express how Alter's learning is mirroring our own. People may be prompted to ask: How sure are we in our beliefs, or in AI? How soft are they, and how hard? * (III) "Canny" "Occupation" (17) Level B, Center Bldg. "A New Kind of Aesthetics, which can be shared with AI"
Is it possible to share aesthetics with others other than human beings? Human natural language has rich poetic expressiveness. However, we cannot get rid of its ambiguity such as polysemy and/or uncertainty. In order for humans to discuss art and aesthetics with others such as AI, it is indispensable to set the foundation for discussion using a common language for both of them. The speakers showed that it is possible to explain the aesthetic and its underlying dynamic relations with an axiomatic structure based on contemporary mathematics. Aesthetics is a kind of function, its consistency and simplicity creates the aesthetic. With the new kind of aesthetics which is not based on humans, the border between humans and machines in art and aesthetics will disappear. Records of Hideki Nakazawa's gallery talk. The language is Japanese. Jan 8 (Mon/Holi), 2018, 19:30-21:30 at Cafe Grano @OIST. Witness the exhibition and the events. - Multiposted above English mail to English speakers.